On May 10, 1981, Bob Duffey rode a 11.71 sec. 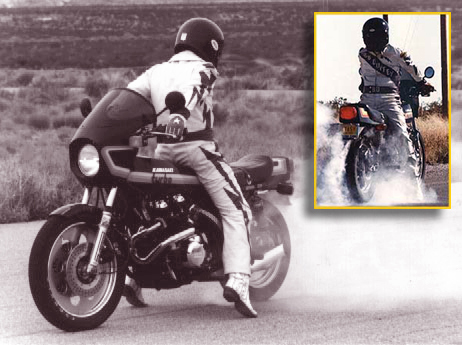 1/4 mile on his 1979 Kawasaki Z1R -TC Turbo backwards at 122 mph! This took place at Green Valley Race City in Smithfield, Texas. See http://www.cyclejumpers.com/duffey.html and http://www.zianet.com/bobduffey/Tours.html In 2015 Bob was featured on an episode of The History Channel's American Pickers, where he sold the leathers he's wearing in the image below to Mike Wolf.